Dr Barry Kaplan attended the University of Pennsylvania School of Dental Medicine. After completing a one year residency at Newark Beth Israel Hospital he completed his Prosthodontic Training at NYU Prosthodontic Program. Dr Kaplan is a Past President of the New Jersey Section of the American College of Prosthodontics, He has also published in peer review journals and presented research to the American College of Prosthodontics and the American Association of Dental Research. He was recently selected as Morris County’s Top Dentist by his piers. Dr Kaplan has resided in Randolph, NJ with his wife and two children for over 20 years. 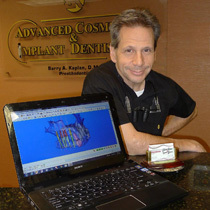 Dr. Barry Kaplan DMD has a 4.9 rating based off of 19 reviews.